The Cheetah Conservation Fund is on a mission to save cheetahs in the wild. 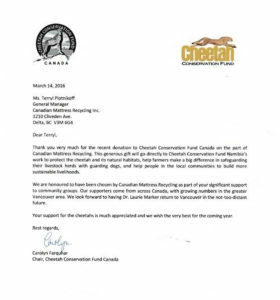 The CCFC (Cheetah Conservation Fund Canada) is raising awareness about the plight of the majestic felines, and hosting fundraisers to support the educational, research, and conservation work the leading organization is doing in Namibia. 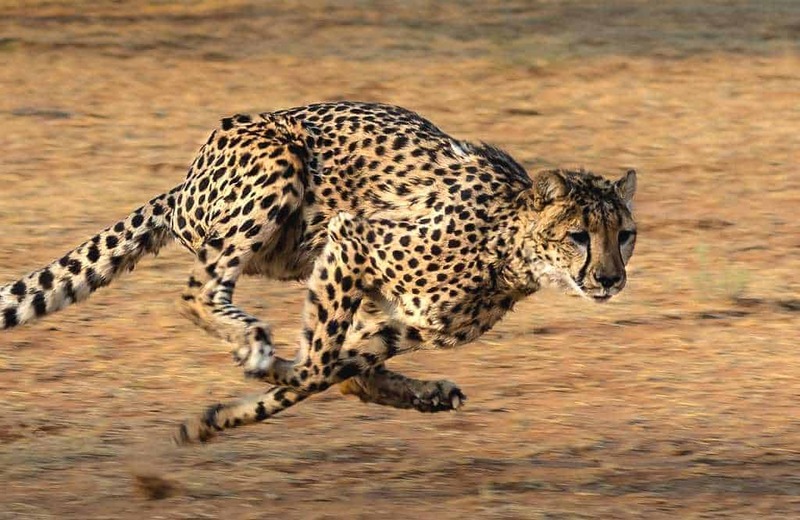 Cheetahs are known as the fastest land animal on Earth, with the ability to accelerate from 0 to 60 miles an hour in three seconds. But did you know cheetahs are also apex predators? Their survival as a species is crucial to the ecosystems they are part of, because without them, the balance of predators and prey would be disturbed. 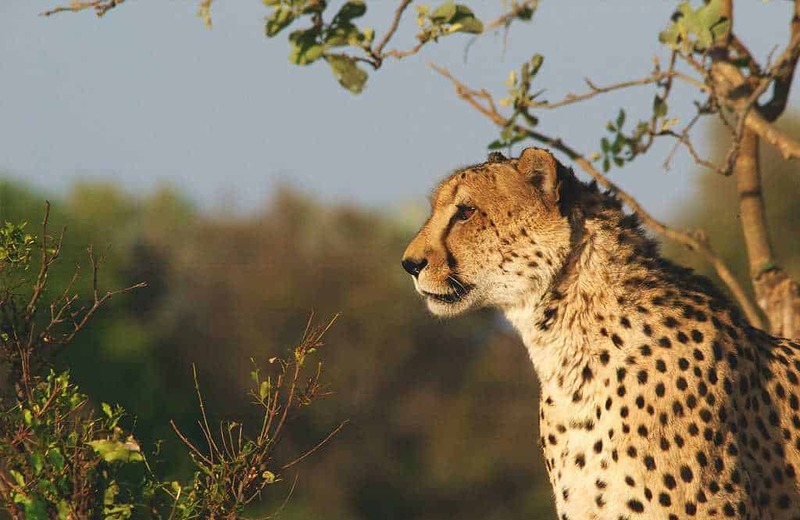 As more open grassland regions are being settled by humans, the cheetahs are fast disappearing. There are less than 7100 cheetahs in the wild due to a loss of grasslands, exacerbating human-wildlife conflict, and illegal hunting. These programs are vital to preserving the majestic creatures for years and decades to come. Cheetahs are on the verge of extinction; their habitats are being destroyed by human settlement. A multilateral approach is needed to conserve these animals, and also to educate those who live there on how to coexist with these creatures. 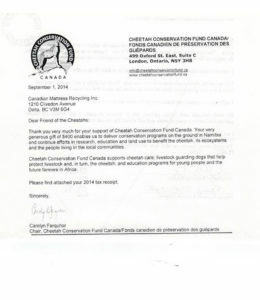 CCF Canada support cheetah education programs, and they also train and provide livestock guarding dogs to decrease the number of cheetahs killed by farmers in local communities. They also teach sustainable farming methods to young Namibian farmers, who would be the future land users and managers. From ecology to land management, and conservation, the CCF supports these initiatives to improve the communities’ livelihoods as well as the wildlife around them. 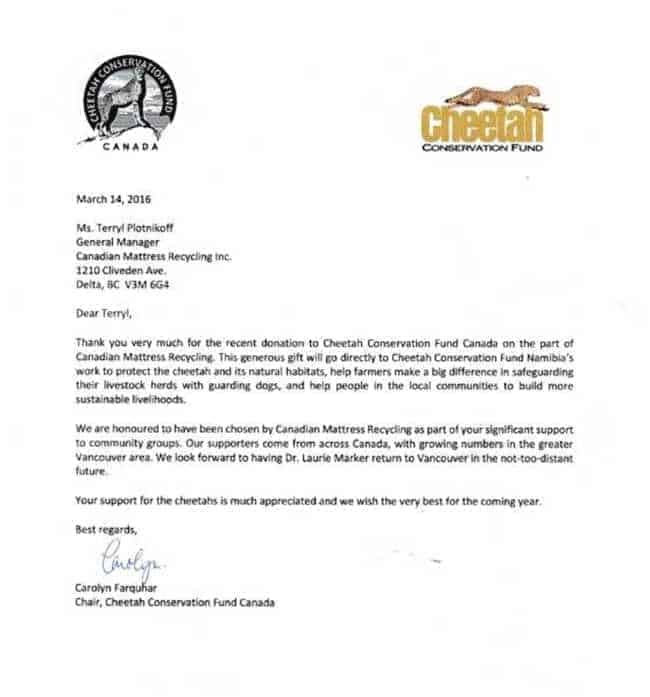 Last but not least, the CCF supports the continual care of orphaned, injured, and old cheetahs. The non profit organization provides shelter, food, and vet exams so that the cheetahs can be rehabilitated and returned to the wild. At one point in 2017, the organization had 39 cheetahs in their care. 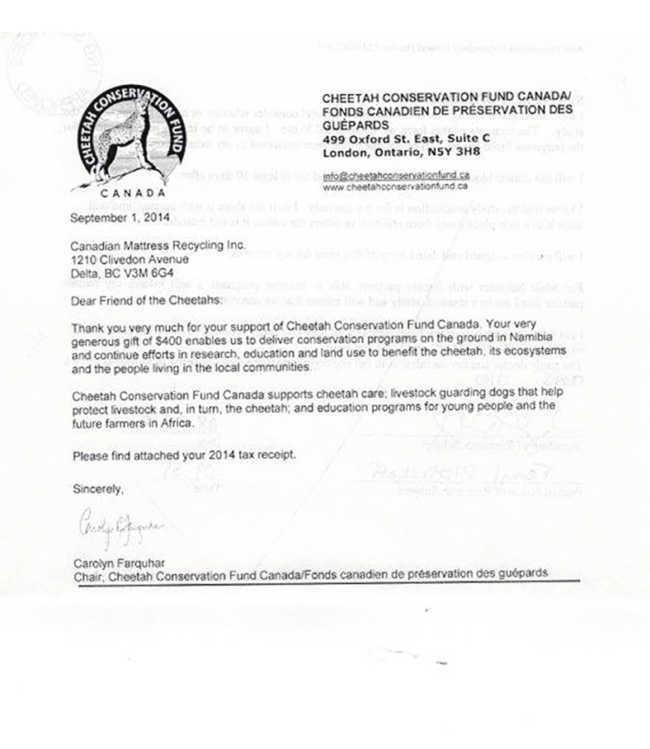 Founded in 1990, the Cheetah Conservation Fund is dedicated to the research and conservations of cheetahs in the wild. The non-profit organization has chapters across the world, including Canada, US, the UK, and Australia, and it is headquartered in Namibia. 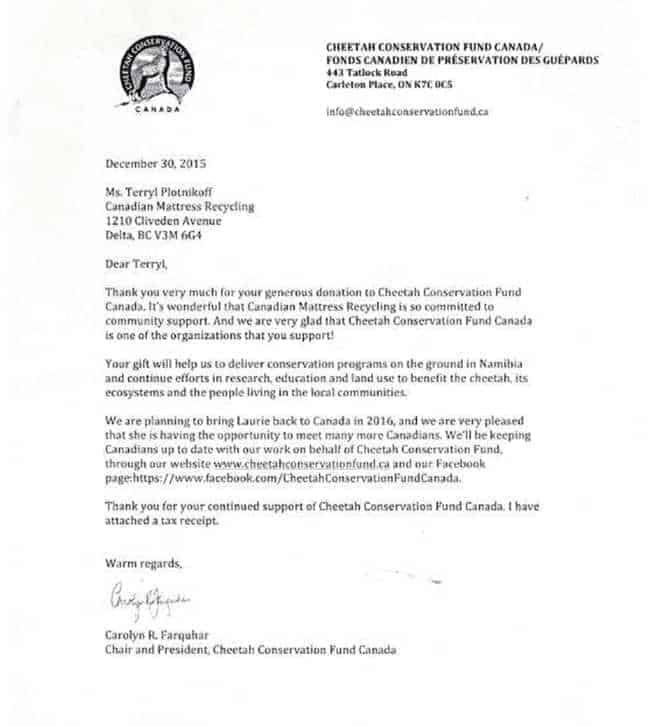 Visit the Cheetah Conservation Fund Canada website, and follow them on Twitter and Facebook. 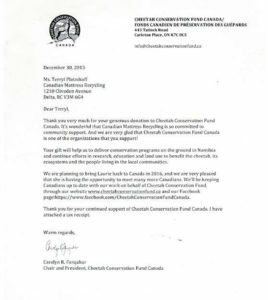 Since 2014, we’ve donated $ 2300.00 to the Cheetah Conservation Fund Canada, helping them to support cheetah conservation programs in Namibia. At Canadian Mattress Recycling, we truly believe in supporting the community. Canadian Mattress Recycling is a 100% locally-owned BC company with a team of employees dedicated to customer service and environmental preservation through recycling. We are located in the middle of Metro Vancouver on Annacis Island on Delta, BC and serve the entire Lower Mainland region and beyond. Follow us on Twitter and Facebook.